Bad omens, good omens: how does a restored Schengen look like? The way ‘Schengen’ has captured the popular imagination around the world does not finish surprising me. After all, not that long ago the term only referred to a sleepy little village along the river Moselle, known for its wine, and not much else. And then came the omonimous (and infamous) treaty that led the way to the creation of a border free Europe. This document, it should be noted, was signed on a cruise ship (the Princesse Marie Astrid), in itself quite an odd feat: how many treaties have been signed on water, and on the move? A rocking treaty indeed! From then, everything was downhill (or downstream, I should say). Almost thirty years on, Schengen is not just still alive and kicking and an established element in Europe’s political landscape. It has also become part of the collective imaginary among European citizens (NB: that does not mean that everybody is happy with it. On the contrary, there has always been opposition to it, and, of late, this opposition has been mounting. Yet, even for its enemies, Schengen is a real and powerful presence to be reckoned with. ) Interestingly, this apparently inexorable process of Schengen mythicization is spreading beyond Europe as well. Elsewhere in this blog. I have described this phenomenon, especially through some of its most unexpected expressions in popular culture (see, for instance, my musings on the recently opened Schengen restaurant in Petersburg). I thought I had seen it all. Instead, recently I came across something that pushes the boundaries of the Schengen mythical saga a step further. What I am referring to here is a video, posted over the summer by a Taiwanese TV channel. The 5 minute clip is a colorful, postcard-like presentation of the town of Schengen as a tourist attraction for a Taiwanese audience. Now, it is true that East Asian international tourism has expanded exponentially in recent years, especially to Europe, and that this new wave of tourists have become more demanding (the classic tour of European capitals does not do it anymore…). Still, visiting a small village in the middle of nowhere? Why on earth? Well, as it happens, the main reason to visit is that…. it is the birthplace of the Schengen regime! Of course! 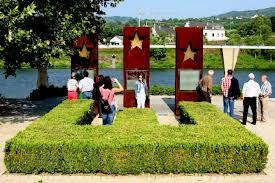 After all, what’s most exciting than visiting the monument that commemorates the agreement, located just outside the town, along the river Moselle (see pic) on a sunny (though the sun is not always guaranteed) European summer day? Together with the Colosseum, the Tour Eiffel, Buckingham Palace, Schengen is the place to be. Or, at least, this what the TV is telling you. See it to believe it, in your next grand European tour! Reflections on the migration across the mediterranean, and its intersections with the Arab Spring and Eurozone crises. A blog by Samphire about asylum & immigration detention and destitution in the UK.